Don’t think of the portly player who was used primarily as a pinch-hitter in the later stages of his Major League career which spanned a record 13 different teams. Don’t think of him as the mumbling, incoherent analyst on Phillies’ TV broadcasts this season. Instead, try to picture Stairs as a versatile player who could capably play second base, third base, and the outfield. Envision a rendition of himself that could steal 23 bases and tie for the league lead with ten triples. 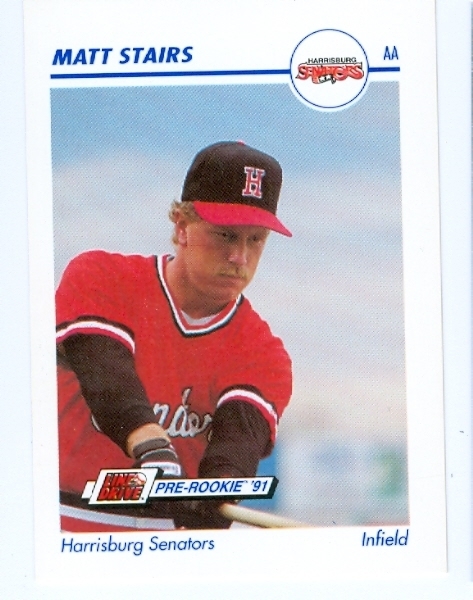 Remember Stairs as the Eastern League MVP during his time with the Senators where he led the league in batting average, OPS, and hits and finished in the top five in six other offensive categories. This entry was posted in Uncategorized and tagged Edgar Gonzalez, Harrisburg Senators, Henry Mateo, Jim Reboulet, Josh McKinley, Matt Stairs. Bookmark the permalink.